Cellfina – Amazing New Cellulite Treatment! 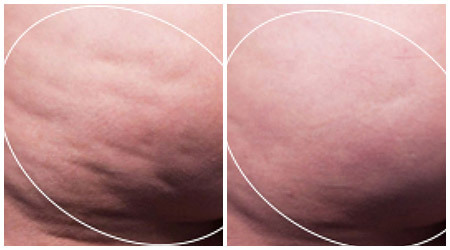 Marina Plastic Surgery now offers Cellfina, the only FDA-cleared, minimally invasive procedure clinically proven to remove the underlying causes of cellulite for at least one year—the longest FDA clearance for a cellulite treatment. In one 45 minute procedure, Cellfina significantly improves the appearance of cellulite on the buttocks and thighs. I am proud to say that I am the first Cellfina customer in the world! I immediately saw that this new medical technology would make a huge difference to the women who suffer from disfiguring dimpling and the inability to feel comfortable wearing bathing suits, shorts and dresses. These before and after photos are pretty incredible. Cellfina is a single in-office treatment with a local anesthetic and limited down time that lasts at least one year offering significant improvement of orange peel like cellulite (some patients in studies have results that lasted at least three years). Cellulite is caused by factors outside a patient’s control. There are countless treatments that claim to get rid of cellulite. But these other treatments—massage, external energy devises, creams and lotions—can only treat cellulite superficially by working at the skin’s surface. Aging, hormones, genetics and dramatic weight changes can all play a role in the appearance of cellulite. These factors cause connective tissue bands under the skin to stiffen, and the fat cells they surround become larger and push up into the skin. That creates the “cottage cheese” effect. Cellfina is safe and effective. Patient studies show that this procedure has a 94 percent patient satisfaction rate. That’s pretty amazing. We believe that looking in the mirror and liking what you see focuses you on the positive and uplifts your day and general wellbeing, so there’s more to getting rid of cellulite than just having smoother skin. You can learn more by visiting our website and remember, dimples belong on your face not your bum!